Signs and Symptoms that you need a Root Canal. A constant and severe pain, a pressure in your mouth, or a noticeable swelling and extreme sensitivity in your gums is enough to tell you that you need an evaluation and treatment right away. Another prominent symptom of pulp tissue damage is when you feel a sharp pain when you bite down on food. A lingering pain after eating hot or cold foods is also an indication of potential trouble and should warrant a visit and exam by us. When you notice any of these symptoms in your teeth, you need to get your examination as soon as possible. Also called endodontics which means, (“endo” – inside, “dont” – tooth) — It’s is a set of dental procedures designed to treat problems of the soft pulp tissue inside a tooth; Containing nerves and blood vessels. Most patients think of it as an unusually painful treatment, in most cases, the procedure involved is no more uncomfortable than a filling. The process is one of the most effective ways available used in relieving patients from many kinds of tooth pain. 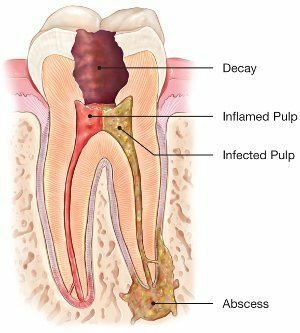 Caring out a root canal procedure on a patient becomes necessary when infection or inflammation develops in the pulp tissue of the patient’s tooth. Pulp tissue is made up of blood vessels, nerve cells and connective tissue — which explains why a problem on that part of your tooth may cause intense and unbearable pain. The pain may go away after some time, but its just temporary and will still come back with more pain. However, without treatment, the infection won’t go away. In worst cases, it can lead to a dental abscess, and may even contribute to systemic problems building up in other parts of the body. 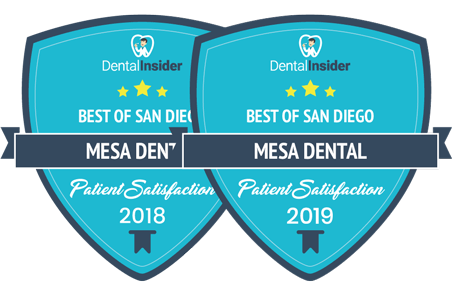 If after examination and the outcome shows that you need root canal therapy, don’t worry yourself because it’s one of the most routine and effective procedures that we do here in Mesa Dental and we do it perfectly, and it can often be accomplished in just one single visit. 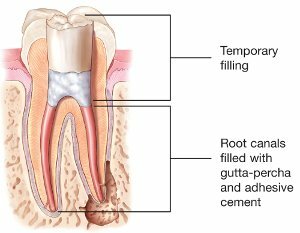 The procedure for root canal process begins the same way as the process for filling does, and you feel no discomfort at all. First of all, an anesthetic is administered to numb the tooth and the surrounding area, so you don’t feel any pain at all. To so many patients, the worst fear is already over. Then, a hole is opened in the surface of the affected tooth to make the pulp chamber and root canals accessible. Tiny instruments are used to evacuate the dead and dying pulp tissue from inside these narrow holes which are known as the passageways. After that, the chamber and empty canals are then cleaned up, disinfected, and prepared to be filled with inert, biocompatible material. Then, adhesive cement follows; it is used to seal the opening made initially on the tooth to prevent future infection. After the root canal treatment, your tooth feels some sensitivity or tenderness for a few days which is normal, and pain relievers like ibuprofen are effective in relieving discomfort, prescription medications may also be administered if need be. After the root canal treatment is complete, it is advisable to avoid biting hard on the treated tooth. All of these symptoms are temporal, and you can go on to use your tooth after the recovery. 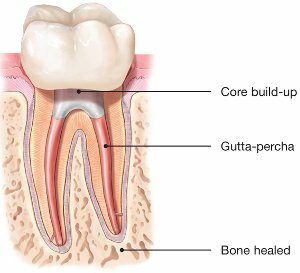 To nurse the tooth and restore it to its natural form, it’s necessary to have a crown or other forms of restoration placed on it. The restoration to be used can be of any form, from traditional gold crowns to Bruxir crowns made to look like your original tooth. Having completed your root canal, you can rest easy knowing that you just preserved your dental health for years to come. We’ve all heard the gag somewhere: “I’d rather have a root canal.” This hilarious comedy line comparing the root canal treatment procedure to something extensively undesirable may sound funny. It’s true that infection or inflammation in the tooth’s pulp can cause excruciating pain. But you should also have it in mind that having a root canal has to do with eliminating this acute pain and the process is not the cause of the pain. Do you need another reason not to delay root canal treatment? 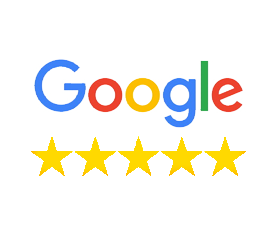 Take a look at this: A natural tooth that’s under infection but is saved via root canal treatment and restoration will always help you avoid facing the problems that occur when teeth must be removed. These include an unwanted tooth migration or tooth shifting, which can lead to difficulties in chewing food; then, the need for bridgework or dental implants will arise, which may be expensive and complicated; and talk more the eventual loss of bone structure from the area of the missing tooth. 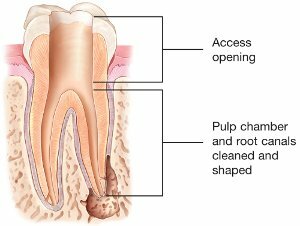 Root canal problems arise from infection and inflammation of the tooth’s pulp tissue. One potential reason for infection is deep tooth decay where untreated dental cavities eventually allow bacteria colonies to build up and work their way down to the center of the tooth, where they heavily infect and cause harm to the pulp tissue. Secondly, another process that may bring bacteria into contact with pulp is via chipped or cracked teeth. Any slight opening in the protective enamel coating of the tooth has the potential to allow bacteria access to the tooth’s pulp. Another major cause of pulp tissue damage is trauma to the tooth — this is the kind that may arise from a sports injury or auto accident. When this happens, it’s essential to seek treatment immediately both to try and save the tooth and to prevent the tooth from having problems in the future. Finally, extensive dental work on a tooth may cause damage to the pulp tissue itself; this treatment should have been done earlier via a root canal. Multiple fillings or restorations on one particular tooth increases the chances of this type of injury on the tooth which may give rise to root canal problems. Besides, some common procedures like crown preparation or orthodontics may eventually lead to root canal problems.